Who says only guys can have fun while their hand stays warm and dry drinking a cold brew? Not any more! 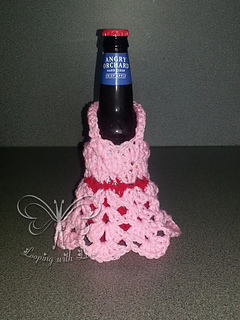 Introducing a cute way to dress up your cold drink: The Dress Cozy! 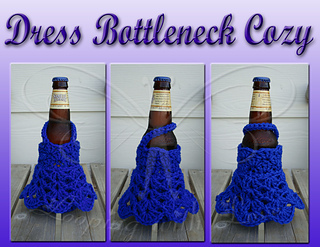 A perfect way to keep your hand warm and dry, while consuming your cold beverage at a picnic, bbq, bonfire, at the beach, party, etc. The pattern includes links to my 2 YouTube videos to walk you through how to do a special beginning stitch (if you choose, so you can hide your seam), and how to finish off a project and a magic circle with an invisible seam. This pattern also includes Photo Tutorials, as well as written instructions, on how to attach the strap, how to start the dress, and how to dress your drink in the cozy. The Dress Bottleneck Cozy has been tested to ensure proper fit and gauge. If you notice any mistakes, or have questions or concerns about the pattern, then please feel free to contact me on my facebook page: www.facebook.com/LoopingWithLove or email me at: looping.with.love@gmail.com. Be the talk at all your gatherings this summer!